G elatin is the purified protein derived by the hydrolysis of collagen-rich connective tissue or bones of animals. Sounds kinda gross, right? If you can forget about what it is, and focus on what it does for your health, you will love this amazing high protein powdered supplement — up to a whopping 11 grams per tablespoon! Much research shows varied health benefits, and some doctors even suggest that vegetarians should also be consuming gelatin or collagen on a regular basis to ensure adequate dietary intake of a complrehensive amino acids. Gelatin is the cooked form of collagen and doesn’t dissolve in water, instead it gels up – making it perfect as a thickening agent. A more intensive processing creates a slightly different product called collagen hydrolysate, and this powder eliminates the gelatin while maintaining a complete protein. Thus, collagen is perfect for adding to soups, smoothies, baked goods, or anywhere else you would use a protein powder supplement. This collagen powder is available in a bovine or fish variety. In a saucepan, combine the juices and honey on medium-high heat for about 5 minutes, stirring constantly. Remove from the heat and sprinkle in the gelatin powder, vitamin C powder and ground ginger, whisking vigorously for about a minute until all gelatin is completely dissolved. 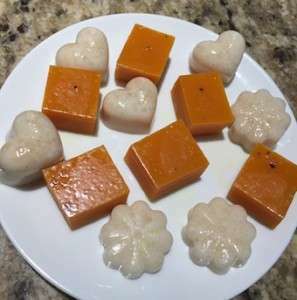 Pour into silicone holds or a 8×8 dish and refrigerate for a couple hours, or until gelatin is firm and you can cut it into small portions with a knife. Store in an airtight container. Will keep up to 7 days in the refrigerator. These make great back-to-school snacks for the kids, and will help them fight off the barrage of colds that circulate every year. For more great back-to-school snacks, see Sweet Potato Cookies and Chocolate Coconut Squares. The entire contents of this website are based upon the opinions of mipstickYvette. Please note that mipstickYvette is not a dietitian, physician, pharmacist or other licensed healthcare professional. The information on this website is NOT intended as medical advice, nor is it intended to replace the care of a qualified health care professional. This content is not intended to diagnose or treat any diseases.Always consult with your primary care physician or licensed healthcare provider for all diagnosis and treatment of any diseases or conditions, for medications or medical advice, as well as before changing your health care regimen.